This photo was taken in the 1960s. Number 21 High Street, Thornbury is the property in the middle of the photograph behind the Morris Oxford Traveller car. We haven’t seen an extensive set of deeds for the property that became 21 High Street in Thornbury, but we have one or two useful documents. An abstract of title dated 1880 mentions an indenture dated 26th December 1810 describing the property as ‘all that messuage or tenement wherein Thomas Cox for some years immediately before to and at the time of his death dwelt and Mary Cox his widow afterwards dwelt and William Williams and Mary his wife (late the said Mary Cox) did then dwell with the outhouses garden and appurts thereto adjoining and belonging situate in the High Street otherwise the Fore Street of the Borough of Thornbury aforesaid with the appurts‘. We note that the 1769 and 1770 Assessment for Poor Rate listings appear to show Thomas Cox as living in the same property, then described as ‘late Powells’. Thomas Cox – the Land Tax records from 1775 to 1783 show Thomas Cox as the person responsible for paying the tax on the property. In 1784 the ‘Widow Cox’ was listed so we assume that Thomas had died. It appears therefore that Thomas was the Thomas Cox who was a well known clockmaker in Thornbury. He was the son of Charles Cox who had died in Alveston on 29th October 1737 aged 38. Thomas was also the nephew of another clockmaker also called Thomas Cox. On 30th May 1791 Thomas’s widow, Mary, married William Williams. The land tax records from 1796 to 1812 show William Williams as the owner and occupant of the property. We don’t know any more about William and Mary. William and Elizabeth Tait – we don’t know much about William Tait and his wife, Elizabeth. In an abstract of title dated 1880 the indenture dated 26th December 1810 mentioned at the top of this page was between William Tait and Elizabeth his wife and William Ford. We haven’t seen the indenture, but from the abstract it appears that the Taits arranged a mortgage with William Ford of £218 and the property had become ‘vested in the said William Ford’. William is first shown as the owner of the property (described as ‘late Williams’) in 1814 land tax record. We assume William Tait must have died by 1819 as his wife, Elizabeth Tait, is shown as the owner in the land tax records. We can’t find any trace of them in the Thornbury parish records so they may not have lived in the town and they let the property at 21 High Street to William Ford. The Fords – the 1819 Land Tax records shows William Ford had moved into the shop at 21 High Street, initially as the tenant of Elizabeth Tait. We are bit confused by the details shown in an abstract of title, but they indicate that William had become financially involved with the property as early as 1810, possibly by offering a mortgage to the Taits. William Ford was born on 11th February 1775, the son of Joseph Ford, a wheelwright and his wife Anne. On 22nd March 1798 William married Ann Limbrick. They had several children: Ann born on 1st March 1801 and baptised on 28th April 1801, Joseph born on 9th December 1809 and baptised on 10th January 1810 and Thomas Limbrick Ford born on 11th February 1804 and baptised on 16th January 1805. They had another daughter, Eliza, born on 14th August 1807, baptised on 27th January 1808 and buried on 9th October 1808. The baptism records show William was a saddler. He was listed in the 1830 and 1839 trade directories as a saddler and harness maker. William continued to occupy the premises, although Elizabeth Tait continued to shown as owner until 1829. From 1830 William Ford is shown as owner. There is a reference in the abstract indicating that by the time of William Ford’s death on 6th December 1839 he had never received any interest from the Taits and therefore assumed control of the property. In his will dated 17th February 1834 William bequeathed all his real estate to his wife, Ann, during her life time and then it was shared amongst his three children, Ann, Thomas and Joseph. William was aged 63 when he was buried on 10th December 1839. The 1840 Tithe Survey (which was based on information collected in the years before 1840) shows that William owned and occupied Plot 189, a house and garden. The 1841 Census shows Thomas Ford as the head of the household at 21 High Street. He was a saddler aged 30. He was living with his brother Joseph, a carpenter aged 25, mother Ann an ‘independent’ aged 60 and sister, Ann a dressmaker aged 35. The 1861 Census shows Joseph Ford had taken over as head of 21 High Street. He was a saddler and harness maker aged 49. His sister, Ann, was still living with him. She was running a Berlin Deposit ary. They were still there in the 1871 census. By his will dated 4th June 1879 Joseph Ford put all his real and personal estate in trust and arranged for his trustees to pay the rents, interest and income from his estate to his sister, Ann Ford during her lifetime and after her death the property should be sold. Unfortunately the abstract doesn’t say who the profits of the sale etc were to be given to. In the event, Ann died on 29th August 1879 aged 79. Joseph died on 5th December 1879 aged 69. On 20th July 1880 the property was sold to George Wetmore for £595. On 2nd February 1897 John Williams conveyed the property to his son, John Hodges Williams. 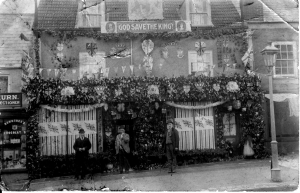 The thumbnail photo on the right below shows the shop brightly decorated at the time of the Coronation of King George V in 1910. Click on the thumbnail to see a larger image. It is particularly interesting to see the large number of little glass pots which were attached to the wall on the second floor level to form an outline of the letters ‘GR’. The Thornbury Museum has a number of these pots in their collection and it is apparent that they were used to hold candles. It must have been quite a display. On 7th December 1914 John Hodges Williams, outfitter sold the property to Francis Williams, assistant overseer for £900. It was described as ‘all that messuage or dwelling house/shop/premises, garden numbered 189 on Tithe Map bounded on the north by premises occupied by Reginald Trayhurn and south by premises occupied by William John Blizzard. Also all that piece or parcel of garden ground together with stable and coachhouse erected thereon containing in the whole 13 perches or thereabouts situate in Thornbury and opening on a lane leading to St Mary Street and numbered 186 on Tithe Map, both properties are now in the occupation of the purchaser’. On 12th July 1961 Francis Arthur Champion of Abu Sueir, 4 Church Road and Herbert Reginald Champion of Severn Villa 60 High Street, both fruiterers and greengrocers vested themselves of The Seed Supply 21 High Street under the will of their mother. On 1st January 1968 they sold the property to Thornbury Rural District Council for £17,000. After a short 6 month lease granted to Norman King to sell cycles and cycle accessories from two rooms in the building, it was demolished and to enable the re-development of the St Mary Centre.